Tobold whined how rare strategy games are. The funny thing is practically every game is a strategy game using his definition "a plan of action designed to achieve a long-term or overall aim; the art of planning and directing overall military operations and movements in a war or battle." Let's take World of Tanks that we both play. It's all about strategy. If you don't consider it, your win chance is totally random: 50%. If you consider strategy, you will have higher. If you master the strategy of your tank class: much higher. 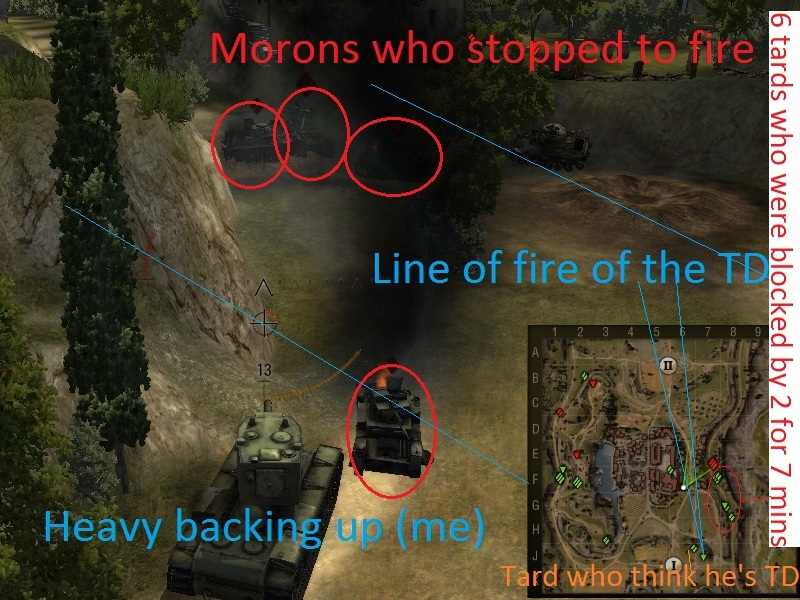 Let me show the WoT strategy. It starts with choosing a lane. The maps usually have 3 of 4 lanes. Which will you choose? It depends on your class, but above all, depends where the others move. If you see the loading screen and you say "hey I like Steppes, let's go left side", you are a capital case moron. You must wait and see where the mindless sheep will go. Of course you can start moving a likely direction but must be ready to turn back if your lane is not the good one. Based on the amount of "teammates" and scouted enemies present on the lane, it can be "zerged" (teammates overpowering), equal and weak. Of course you can only guess here. If you see 9/16 go one lane, 3 on the second and 1 on the last (2 arties and 1 you) you have every reason to consider the first zerged, despite the enemy may all go this lane, making it weak and the other two zerged. Light: you go to the zerged lane and stay 100-200m ahead of the zerg. No, don't run away from them to the back! Your job is not to get that damn "scout" achievement, die, and then type "ffs arty why no shoot". That "strategy" is based on the assumption that the arty worth more than a heap of dung, which is unacceptable on a random match. The assumption that "one out of 9 can hit a lake from the bottom of it" is much safer, though there are no guarantees. Obviously, if they already have a scout, you can stay behind them and take the scout's place when he is down. Medium: If unsure, or see lot of fast scouts at the enemy, stay back and defend the arty from the mindless zerg of T-50-es. Also, you can join the proper lane later as you are fast. Choose the balanced lane and win it. Press forward to the enemy base. TD: Choose weak lane. Stay at the back, pick a nice bush and hide. The enemy will come into your cannon. If the weak lane has a defender (rushing idiot doesn't count), be forward enough to cover him. The hardest job for a TD is deciding who worth saving and who doesn't. If in doubt, choose to not save him and stay further back. Heavy: Choose weak lane. If there is a TD or back-camping other tank, consider his line of fire when choosing cover. Artillery: in a non-obvious spot where you can fire instantly. If you see morons rushing forward, stop where you are, aim on the enemy base to be ready when the moron arrives. As the member of the zerg you must push. If the situation stalls, 6 of you and 3 of the enemy is out of combat. In some other lane they are clearly winning, you have no time, you must risk. If you have speed, run for the small obstacle, circle it. Shoot one on the back on the run. For God's name, don't stop to aim! If you are have armor, push to the mid. Make sure that if you die, your corpse won't be another obstacle. Don't stop to fire either, shoot from close range to a defender but don't stop for TD food. The zerg behind you will stop and fire. As defender you must win time. Taking out 2 and dying in 1 minute is worse than just dying after 3. Hide. Every second you win for the team is a second the others can push on their lane. Don't even try to get to firing position, you'll fire when one move into your face. Ignore small tanks, they are just distraction. Always mind the line of fire of the TD, don't block it. One more thing: if you are alone in a lane with no visible enemy, consider yourself defender. Maybe it's totally empty and you could score big, but more likely you'll be TD food rushing. Considering draws a half-win, I have overall 59% wins. That includes every tanks, including the ones that I just ran underequipped to get the next one. Since there isn't much twitch and reflex in this game, this winrate is only determined by superior strategy, understanding how the social sheep will act. But by having good strategy, choosing a good lane and moving properly, you can change your win:defeat from 1:1 to 3:2, and it isn't nothing. This, and most others are strategy games, granted you must carry out your strategy with your own clicks which can be felt grinding. While I think you are are correct in your basic strategies on how to play random battles in WoT, I dare say 3:2 is a bit of a stretch. In many battles, you are so underpowered in comparison and what is more important, your teammates are so incredibly stupid that you do not matter, even if you play reallt good and also try to help your team in chat or whatnot. Most of the time, they do not listen to warnings or anything you do. "the art of planning and directing overall military operations and movements in a war or battle." In other words, things like "Should I invade Sicily?" What you're discussing here are tactics, which are completely different. though your observations may or may not be correct they do not contribute to the discussion of WoT being a tactical strategy game. Do you really expect people to be ashamed of their native tongue? Are you afraid of yours (since it's obvious from your grammar that english is not your first language). It's not being ashamed of one's native tongue. It's recognizing that communicating in a language your teammates can understand is more effective, so do it. The beauty and splendor of your native language contributes 0 DPS.